On the edge of Ventura retail park in Tamworth is KFC and Costa. 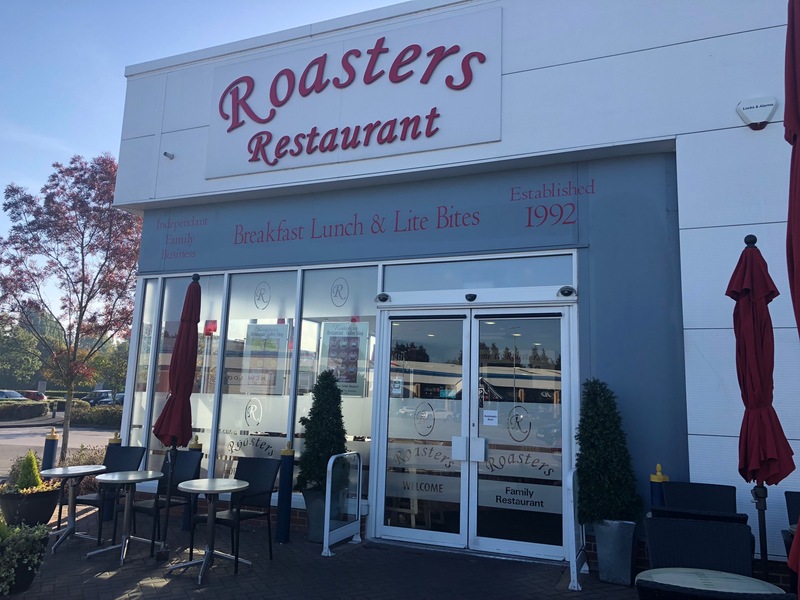 Next door to Costa is Roasters. The walls and signage shout out that its a family owned business, extablished in 1992 and they have 2 sites, here and George Street, (I didnt know). I have never tried this place until today. I entererd at 09:05. There were 3 people in front of me giving their orders. I waited 7 or 8 minutes until someone spoke to me. I even said hello to the chap behind the counter who was drinking his tea/coffee. We smiled, he walked off. This was a lesson in inefficiency. 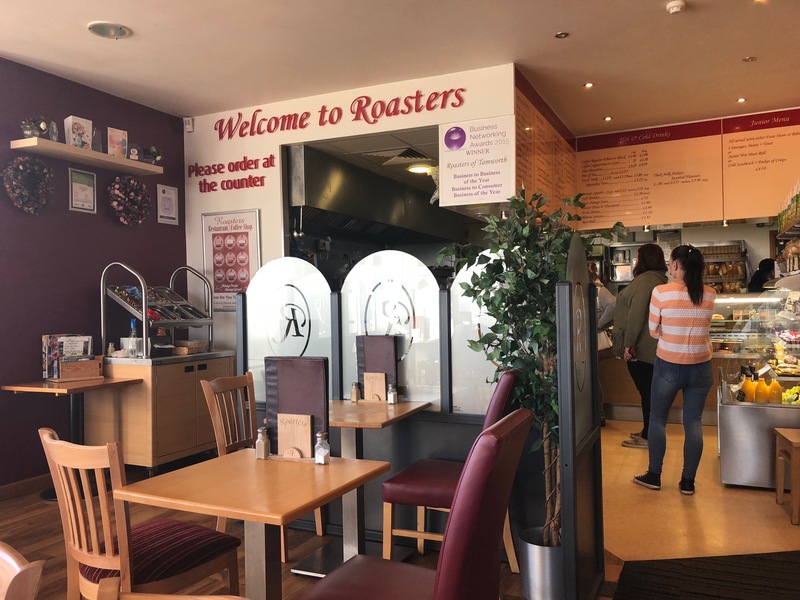 Signs in the cafe mention they are proud to work with local suppliers. 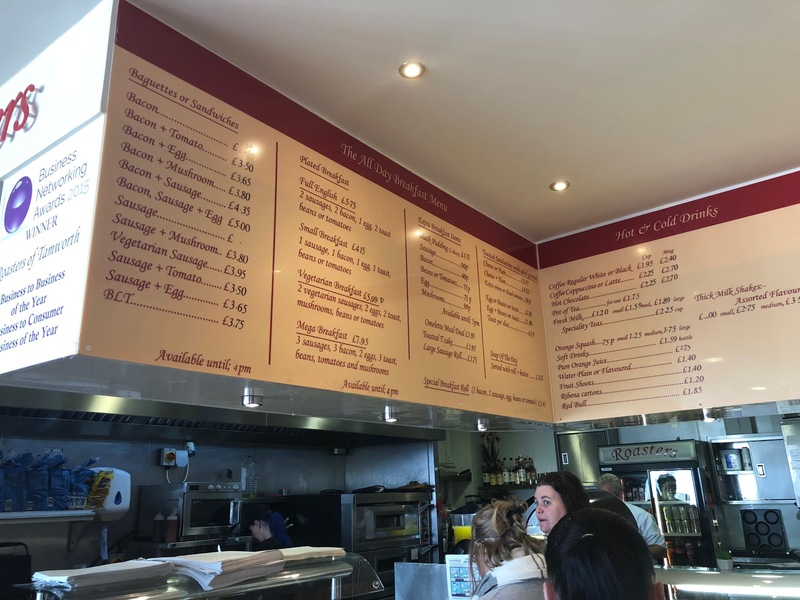 I asked, the local suppliers, were Fairfax Meadow and Gills the Butchers, both wholesalers, one in Derby, the other in Wolverhampton, (not what I would call local) – nothing here seemed that it wasnt from a cash and carry. If they are using local suppliers, then they are very much at the bottom end of their respective product ranges. 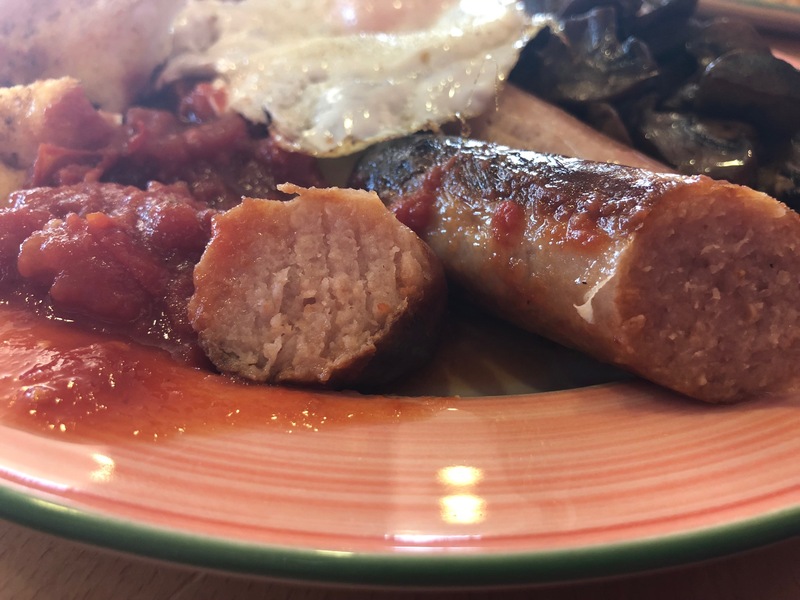 My Full English included 2 sausages, 2 bacon, (fatty, but reasonably thick and tasty), 1 fried egg plopped on the top, 2 toast and beans or tomatoes. I opted for tinned tomatoes, but forgot to ask for them separately, so they contaminated the other ingredients. I ordered mushrooms as an extra. 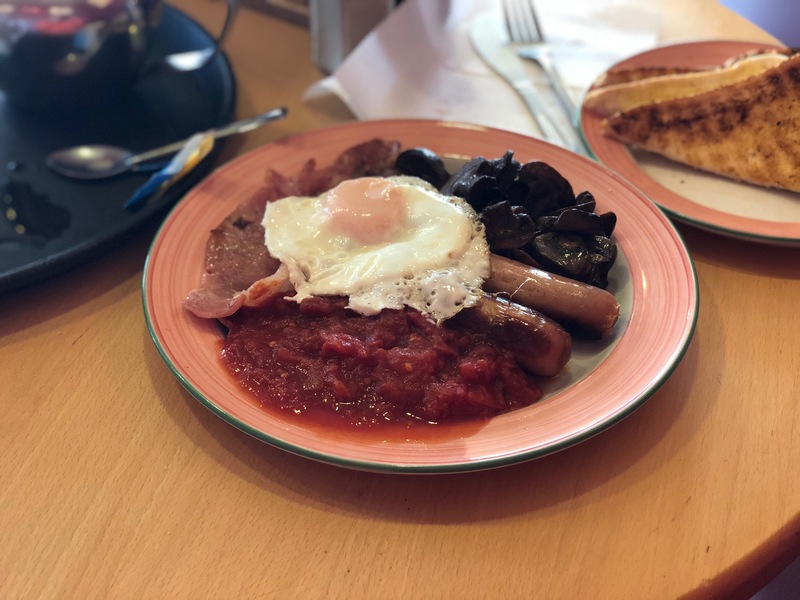 They were luke warm and not that great – they looked like they had been cooked a long time before… I also ordered a pot of tea, (I found out that this was free, as I ordered my breakfast between 8:30 and 9:30 on a weekday. Who knew?! The breakfast was filling, just not very good. Everything was very much pre-cooked and just finished off on the griddle. To have hash brown, mushrooms, black pudding etc was extra. 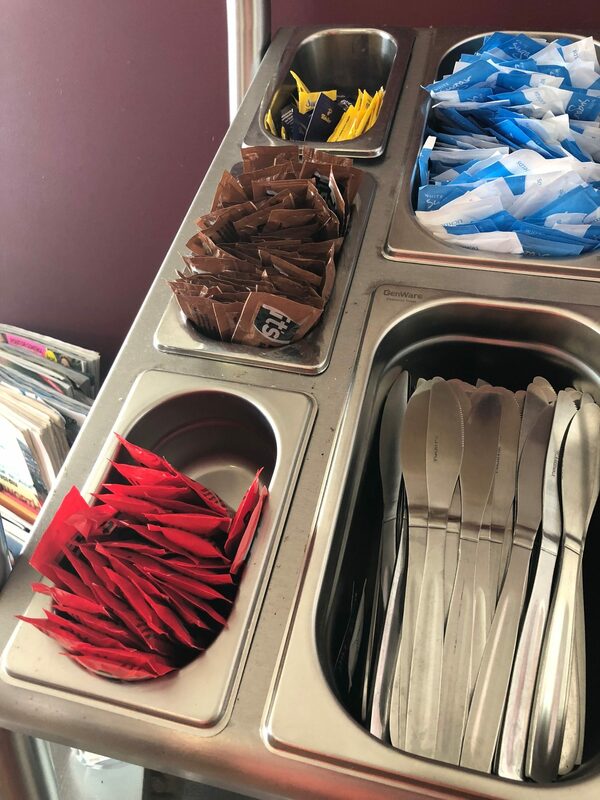 Another gripe: Help yourself cutlery and cheap and nasty sauces. My advice: If its not HP and Heinz, dont serve it. On a good point, the kitchen looked spotlessly clean. The bench seats in the restaurant had what looked like food debris in the creases, but overall it was very clean, (though tables used by diners that left their plates/cups etc were still there for a long time after they left). Free pot of tea as I was there at the right time. Unfortunately, on its own, thats not good enough. Would I recommend this place: No. They need to up their game. The customers deserve better.